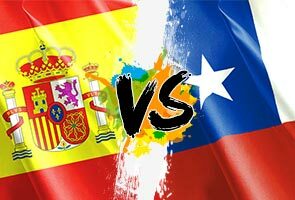 Spain face a life-or-death World Cup clash against Chile on Wednesday. MADRID: Stunned by their heroes' 5-1 humiliation by the Netherlands, Spaniards are already bemoaning the end of a glorious era and fearing the worst in La Roja's life-or-death World Cup clash on Wednesday with Chile. Diego Maradona put the challenge in a nutshell. "So how are Spain going to recovery from this massive blow? Spain isn't used to letting in five goals," the Argentine legend told Latin American television station Telesur. On Friday night as Spain crumbled in the second half against the Dutch onslaught, some supporters still held out hope. "In 2010 we also lost the first match," one female supporter said tentatively. "But this was not just a defeat, they crushed us," said another fan. After a historic triple -- Euro 2008, the 2010 World Cup and Euro 2012 -- Spaniards are suddenly facing up to the prospect of losing heavily, perhaps even falling out in the group stage. "I have the impression that it's the end of an era. The cycle of victories is over," said Javier Gomez, sports presenter for the private television station La Sexta. He does not think Spain will make it to the quarter finals. "It is the end of a footballing model," he said, the "tiki taka" trademark of Spain and Barcelona in which players make rapid-fire short passes aimed at frustrating the opponents by depriving them of the ball until the moment it ends up their net. It is a style that is now under challenge from a faster, more physical game, Gomez told AFP. "Against Chile they may be able to take control because the players have been stung. But it's going to be very difficult because Chile are a very disciplined team, relentless, very physical on the attack," he predicted. And even a win against Chile may not be enough in a group B dominated by an avalanche of Dutch goals. "Chile are going to try for a draw. I don't think Spain will be able to score more than two gaols," fretted 21-year-old Madrid student Yoel Plaza as he left an official Real Madrid shop in the Spanish capital. Spain's squad was selected with no thought for the future, Plaza complained. "This team live a lot in the past, in what they did in the European Cup and the World Cup. There are players who weren't chosen and who could have been a lot better than some in the team have been," he said. Online, many supporters seem to be ready to give a second chance to Spain, and keeper Iker Casillas who was savaged by the sporting press for his performance against the Netherlands. According to sports daily AS, more than 30,000 people online said they want him to be in goal again, against 18,200 for David De Gea. "Casillas is still valued by the public but commentators and professionals have their doubts," said AS journalist Juan Jimenez. Casillas will definitely be on the pitch when the Chile game starts on Wednesday, said Javier Gomez. Spain coach Vicente del Bosque is known for being faithful to his players, he added. "If he takes him off, he kills him." Spanish manager Rafael Benitez, the former Liverpool boss now with Napoli, warned against burying La Roja too soon. "Their philosophy has given them numerous triumphs in the past. That should not be forgotten. And they should not change that because of a single defeat," Benitez wrote on his blog, quoted in leading Spanish sports daily Marca. "Spain has to think of victory and scoring goals," he said. Speaking of Spain's squad, journalist and writer Enric Gonzalez warned in conservative daily El Mundo that "there are corpses that bite". "They know and their next rivals know and we ourselves know that as a team they're dead. Dead but not out," he wrote.